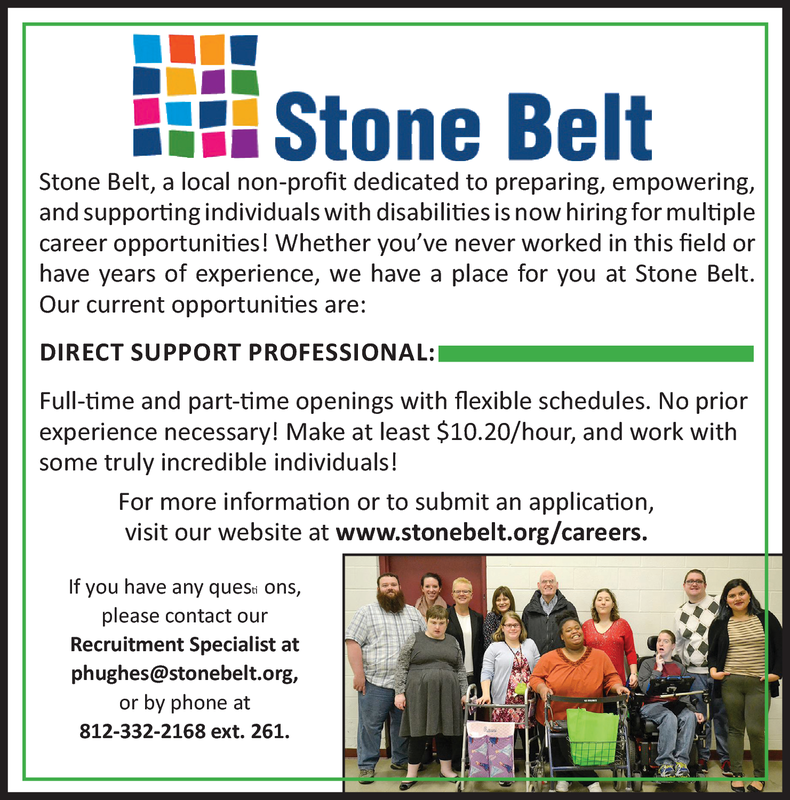 Stone Belt, a local non-profit dedicated to preparing, empowering, and supporting individuals with disabilities is now hiring for multiple career opportunities! Whether you have never worked in this field or have years of experience, we have a place for you at Stone Belt. Full-time and part-time openings with flexible schedules. No prior experience necessary! Make at least $10.20/hour, and work with some truly incredible individuals! As a Direct Support Professional (DSP) with Stone Belt, you will have an opportunity to work with some incredible individuals and provide an integral service to our community. You will assist our clients in leading self-directed lives and contributing to society. Our DSPs assist with activities of daily living and encourage our clients to exhibit attitudes and behaviors that promote community inclusion. In turn, you will walk away from work every day knowing that you have made a direct, positive impact on the life of someone in your community. Our ideal DSP is someone who is highly-motivated, and enjoys working with others. You see the potential in people and love to help others achieve their goals. You can navigate high pressure situations and aren’t afraid to reach out for help when you need it. This is definitely not a desk job, so you need to like staying active at work and appreciate variety in your daily routine. You do not have to be experienced in working with individuals with disabilities – we will give you all the training you need! All we ask is that you value giving back to your community, have a calm and considerate personality, and enjoy working in a positive, uplifting environment. If any of the above description resonates with you, we encourage you to apply with us today! We have full-time and part-time positions open with hours available to fit any schedule. Whether you are looking to take the next step in your career or simply want a part-time job with a flexible schedule, we have a place for you at Stone Belt! Come join the team and see what caring is all about. Qualified applicants will possess at least a high school diploma or G.E.D. Experience working in healthcare or human services is preferred, but not required. Applicants must also have a valid driver's license and be eligible for coverage through the agency's insurance. We believe in the uniqueness, worth and right to self-determination of every individual. Therefore, it is our mission, in partnership with the community, to prepare, empower, and support people with developmental disabilities and their families to participate fully in the life of the community.